Some birds give the Avian Class a bad name. While those cute little eagles or hissingly aggressive geese don't surprise us, this example of anthropomorphic behaviour could put the cat among the pigeons. Martina Muller and Professor Dave Anderson of Wake Forest University in North Carolina have bridged an ethology gap. 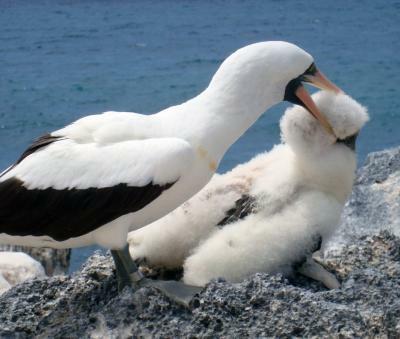 Nazca Boobies, related to other ocean travellers such as the famous wandering albatross, live in the Galapagos. Unfortunately, parents have to leave nestlings frequently to fish long-distance. "It's fascinating that many would consider an extremely complex human phenomenon is also occurring - perhaps through the same physiological mechanism - in Nazca boobies, which are more closely related to crocodiles than mammals," quotes Prof. Anderson. He refers to a special kind of chick child abuse that his team have studied, that seems to have relevance to human psychology as much as bird behaviour (ethology). A Nazca booby adult begins an unwelcome visit with an unguarded nestling. Most such visits include these aggressive bites by the adult to the nestling's head and neck. Credit: Jacquelyn Grace. On the islands, such as this booby colony on Isla Espanola, there is an intense interest by certain adults in unrelated chicks, especially when its parents are necessarily absent for long periods. Female birds are most likely to search out, bully, bite, peck and jump on a chick's neck and head. This causes severe traumatic stress and bleeding and now seems to have caused those chicks to remember the events and, years later, become abusers themselves. Over three seasons, primary data was collected, then data gathering was repeated several years later. The team checked out the individuals that had been abused in the original studies. The Wake Forest team, apart from Martina, who has now moved to Groeningen University in the Netherlands, is now intent on studying the physiological effects of the beatings. They have begun by discovering the major stress hormone, corticosterone, increases after abuse. Jacqueline Grace, leading the team, has already published on this research, but hopes to progress further. The potential links between behaviour, psychology and the two physiologies could be intriguing. The cheeky thought occurs that many seabird colonies have similar events, and it may not be entirely necessary to concentrate on a lone species' distant colonies, where even the identifying leg bands are less common than say one of the more famous European colonies, Martina Muller! (Well, she has moved there! ).